The eligibility process for the Certified Health Education Specialist (CHES®) examination is based exclusively on academic qualifications. In many cases, this involves an intensive official transcript review to determine if an applicant’s coursework reflects these necessary qualifications. The first thing to understand is that every official transcript submitted with an application (or prescreen) is reviewed on an individual basis. Know that course titles vary widely from university to university, as does course content. If the exam coordinator who reviews your transcript is uncertain about the content of a course you have taken, she may ask you to provide a course description or syllabus. Tip: Printing out your course descriptions before applying is also an excellent way to provide you with more clarity on what might be an accepted course, and which could be excluded. During application review, the Exam Coordinator is looking for an applicant to have completed a bachelor’s degree with at least 25 semester credits (or 37 quarter hours) of coursework specific to the Areas of Responsibility of Health Education Specialists. 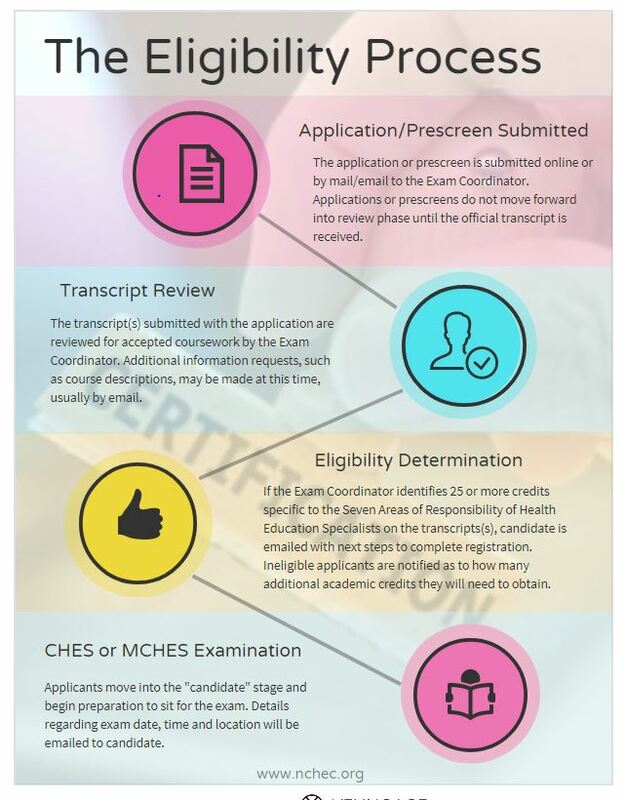 This is to ensure that each candidate has met nationally validated Responsibilities, Competencies, and Sub-competencies that define the health education profession and distinguish CHES® and MCHES® from those trained in other disciplines. Process courses are the most integral to eligibility, and you MUST have completed at least 12 semester hours (or 4 courses) in this category. Although it is not necessary to have content or general courses as part of the total 25 credits required, some may be considered as part of your eligibility during review. A prescreen application is often used in place of a regular application, if you are in any way unsure of coursework eligibility. In fact, there are benefits to using the prescreen service that you may not be aware of. You will not need to resubmit an additional application if you are eligible. You simply log back into the account you create, and complete the exam payment and select a test site location. Prescreen applications receive priority during the review process - so your results will be received within about 2 weeks or less. Traditional applications may take longer. If you are not currently eligible, you will learn exactly how many credits you are missing, as well as sample course titles to help you select additional classes. You can pick up these credits online if you wish. The cost of the prescreen ($25) is subtracted off of your application fee if you are eligible, so you will not end up paying more than the cost of original exam fee. The date of your prescreen application will be considered your exam application date, so you will not incur a higher exam fee due to a deadline cutoff. Do not let confusion over your eligibility review stand in the way of submitting a prescreen or an application for the CHES® exam. The certification is both nationally and internationally recognized and accredited, and therefore requires thorough and consistent review standards for all candidates – everyone who applies must follow this process! NCHEC staff are always available to answer questions and walk you through the process and your results. MCHES® eligibility differs from CHES® eligibility. For more information on MCHES® eligibility requirements, click here.